The Backscatter FLIP7 Pro Package combines a FLIP7 Three Filter Kit with the MacroMate Mini +15 Lens. The FLIP7 has three different colour filters that are optimised for different depth ranges: SHALLOW, DIVE and DEEP Filters. The handy flip system allows for easy switching between two mounted filters, offering the best colour correction for the narrow white balancing band of the GoPro range. The +15 MacroMate Mini Underwater Macro Lens enables you to use the GoPro PHOTO MODE for stunning macro photography. The design team at Backscatter spent more than a year perfecting the ultimate macro lens for GoPro. Watch the video below to see razor sharp macro images and open a new door on your GoPro creativity. Don't be fooled by imitations. The +15 MacroMate Mini follows a 17 year product design of premium underwater optics and rugged construction. No plastic mounts to break and only the highest grade multi-element optics receive the FLIP and MacroMate brand. The FLIP7 packages come with two different spacers and a bracket that allows it to be mounted on all current GoPro models: HERO7, HERO6, HERO5, HERO4, HERO3+, and HERO3, as long as you use either the Standard housing, Dive housing or the Super Suit Housing. The FLIP7 system is made of robust anodised aluminium, and mounts onto the housing by easy clamp-on attachment. The lenses are incredibly strong so it will be able to withstand the knocks and bumps that dive kit gets. One filter is not enough. Backscatter has made thousands of dives to determine the best filter formulas for all diving depths. This 3 Filter Kit is your simple solution for the perfect colour. 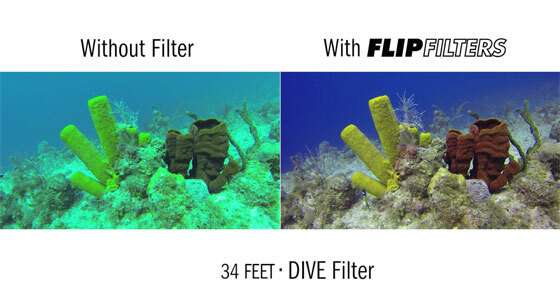 Flip between any 2 filters on the same dive with the touch of a finger. FLIP7 is designed to survive the drops and abuse that we regularly give our own gear. With aircraft grade aluminum and virtually unbreakable filter optics, we're confident you'll find that the FLIP7 system delivers the most rugged design along with the world's best colour for GoPro. The FLIP7 system supports two filters at a time, allowing you to quickly switch between filters using a finger to flip the mounted filters up/down, or to the side.